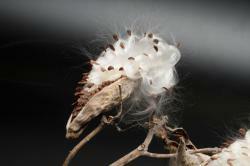 Dry milkweed with mature seed pods. Hey! Yeah, you! You want some rope? I can do rope. My bark is very ropey. What about rubber? Natural latex in a temperate climate? Where else are you going to find that? Just let me get you some rubber. Down! Down is what you want. For hypoallergenic pillow and comforter filling. Or life preserver stuffing. It’s soft, warm, and waterproof. You’d love it. Some down, then? No? Ok, some tender, delicious shoots then, maybe? Or… the pods could make, like, little boats for tiny people. How about that? Monarch caterpillar food? Ok. Yeah, yeah… That’s me. Sigh.